The government has confirmed a plan to ban extreme discounting of alcohol in England and Wales. 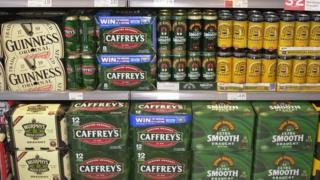 The Home Office said new rules setting minimum prices for different drinks would come into effect on 6 April. Ministers hope the plan will end the practice of supermarkets using drink as a loss-leader - selling drinks at below the cost they pay themselves. But critics have described the plan as "laughable" because it will affect only 1% of sales. Last year the Home Office dropped a proposal to follow Scotland's lead by setting a minimum price per unit of alcohol. Instead, it said it would use existing licensing laws to prevent supermarkets offering deep discounts. The new scheme, which will be in force before the World Cup, requires retailers to use a complicated formula based on alcohol duty and VAT to calculate a floor price. A 440ml can of 5% beer will have a minimum price of 50p. A standard bottle of 40% vodka could not be sold for less than £10.16 and a bottle of wine would retail for at least £2.24. These prices are higher than the lowest-discounted alcohol currently available in England and Wales - but below Scotland's tougher minimum pricing scheme. Officials estimate that 1.3% of sales - 200m litres - will become more expensive and this will lead to an overall drop in consumption of 0.04%. Official figures suggest the scheme will cost business £4m to implement and the Treasury will lose £5m. But they also project savings of £5m for the NHS and almost £4m because of fewer crimes. Ministers say that setting a pricing floor will target "pre-loading" in which people consume heavily discounted supermarket drink before going out to pubs and clubs. One small research project found that two-thirds of young people arrested for alcohol-related disorder in one city had pre-loaded with cheap alcohol. Crime Prevention Minister Norman Baker said: "The coalition government is determined to tackle alcohol-fuelled crime, which costs England and Wales around £11bn a year. "Banning the sale of alcohol below duty plus VAT will stop the worst examples of very cheap and harmful drink." But Eric Appleby of Alcohol Concern said: "The idea that banning below cost sales will help tackle our problem with alcohol is laughable. It's confusing and close to impossible to implement. "The government is wasting time when international evidence shows that minimum unit pricing is what we need to save lives and cut crime." The Scottish Government's plan to introduce a scheme to set a minimum price per unit of alcohol is currently on hold because of legal challenges from the drinks industry.